KÖMMERLING is part of profine GmbH, a large international group of window extrusion companies represented internationally. profine is number one in Europe for PVCU window and door profiles and is the market leader in many other countries as well. 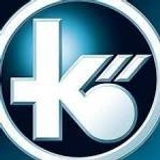 KÖMMERLING was founded in 1897 as a family business in Pirmasens, Germany. In 1957, the first PVCU roller shutter profiles and ten years later, the first PVCU window and door profiles were extruded. KÖMMERLING was one of the pioneers in the PVCU profile extrusion technology. The production of rigid PVCU sheets also started in 1967. The headquarters for KÖMMERLING profiles and sheets are based in Pirmasens, Germany. However, additional extrusion plants have been set up in France, Spain, Italy, Russia, the USA and China. Subsidiary companies have been founded in many different countries on all continents including North and South America. The KÖMMERLING PVCU window systems fulfil the requirements of the American Standards AS 4420 and AS 2047. The company’s quality management system was awarded the British Standards Institute (BSI) Certificate and the Spanish AENOR. It is evident that KÖMMERLING products are intentionally designed and extruded to meet the most stringent quality requirements. These technical requirements, combined with those already described, form the circle of quality established by KÖMMERLING. The level is main tained with regular checks on the quality of their profiles by way of the analysis of random samples taken from daily production. This ensures that their quality always accords with the highest of demands. At KÖMMERLING, quality must meet the most stringent standards of the industry 100% of the time. This means extending quality control to the entire profile manufacturing process. Raw materials : • Granulometry • Humidity as %. • Impurities. • Adhesive bonding capacity, etc. Manufacture : • Jellification • Vicat temperature • Modulus of elasticity • Dimensions and tolerances, etc. Completed profile : • Impact resistance • Xenotest for resistance to weathering • Strength of corners • Modulus of elasticity, etc. Windows Beautiful things are readily noticed. Indeed, windows built from KÖMMERLING profiles are strikingly attractive and beautiful. They bring fresh aesthetic beauty to new and old buildings alike. The windows in your house ignite “the sparkle in your eyes”. PVCU windows from KÖMMERLING are built according to a carefully designed profile concept. This concept allows for many different window designs, with the greatest variety. With KÖMMERLING products, you can implement your very own personal style  windows of all shapes and designs : rectangular, polygonal, round or extra large units. When it comes to making your ideas reality, KÖMMERLING profile systems give you virtually unlimited freedom. KÖMMERLING PVCU window and door systems have been successfully used in swimming pools, mari ne and ocean environments without deterioration of surface finish or performance. Resistance to driving rain and joint tightness are major assets of KÖMMERLING window and door systems. KÖMMERLING PVCU profiles fulfil the requirements of the American Standards AS 4420 and AS 2047. The windows are watertight up to 450 PA (N6). Due to their excellent material properties, KÖMMERLING PVCU windows and doors are ideal for installation in buildings located in coastal areas. These areas typically have permanent exposure to strong wind, heavy rain and salty air. The windows have passed several severe tests designed by official institutions. All window types are capable of withstanding the tests specified in AS 4420.2 and AS 4420.6 (rating N3 and N4). This makes KÖMMERLING profiles suitable for highrise buildings. Save on energy costs and improve your quality of life. Nowadays, whether used for old or new buildings, windows are rated in terms of specific measurable construction and physical characteristics. One particularly significant feature is their ability to protect you against heat. Inefficient windows are one of the main reasons why a building faces substandard insulation. PVCU windows, by contrast, not only help you to save money (because greater thermal insulation means reducing energy consumption for either cooling or warming of your house) but also contribute to reducing the harmful emissions polluting the environment. Even very tough climatic conditions such as extreme temperatures or saltladen sea air cannot stop PVCU windows from doing their job. They donâ&#x20AC;&#x2122;t even need timeconsuming, laborintensive care. Their long lifespan, dimensional stability and robust surface ensure that you will enjoy your PVCU windows for a long, long time. ** The value U is a measurement of the insulating value of a material, being a reflection of the heat loss which is transferred through a unit. PVCU profiles are by far those with the smallest amount of energy to escape. Thermograph of a section of a window with KĂ&#x2013;MMERLING profiles. The number of breakins is constantly increasing. Burglars usually find their way in via the windows  even during daytime. To make things as difficult as possible for such unwelcome “guests”, you should play it safe  especially with windows. You can achieve very effective protection against such unpleasant surprises thanks to KÖMMERLING PVCU window profiles. KÖMMERLING sashes and frames are made of stable, high impactresistant multichamber PVCU profiles with integrated steel reinforcement. Highly effective security hardware combined with special glass provide the maximum achievable security for your windows. In addition, lockable handles are available and also a great choice for households with small children. The need for noise insulation The insulation requirement for the window depends on the use of the building and the level of outside noise (a moderate reduction in noise intensity will be per ceived as a major reduction in the sensation of noise). Windows installed with KĂ&#x2013;MMERLING profiles result in reductions of up to 45 dB, depending on the type of glazing used. Noise stress can be a major cause of illness. It not only damages one’s hearing, it also leaves persistent marks on the human psyche. For many years, effective protection against undesired noise has not merely been a matter of comfort, but a decisive issue in health pro tection. Since windows are – literally  the thinnest parts of a building’s shell, they play a decisive role in the acoustic absorption values of your house. Especially in buildings located alongside roads with heavy traffic or in the close vicinity of airports, efficient noise insulation is a critical requirement. The usual procedure in such locations is to install multipane insulated sealed glass units. Even better sound absorption values can be reached by using special composite laminated glass. The relationship between physically measurable noise levels and the way they are perceived by the human ear can be roughly summed up as follows : ambient noise made 10 dB quieter halves the human perception of this noise, 10 dB lou der doubles this perception. Heavy traffic generates a noise level of around 7580 dB. By fitting PVCU windows combining KÖMMERLING highgrade, multi chamber profiles and special insulating glass, you can reduce this noise by up to 45 dB, and thus only perceive 1/24 of the outdoor noise inside the house. Traffic noise is almost completely muted and calm is maintained. Even around major airports, sleep will no longer be disrupted thanks to this noise reduction technology. For more than a century, KÖMMERLING has invested its knowhow and resources in research and innovation. Its products are designed to help improve quality of life for the homeowner. Advanced technology has enabled KÖMMERLING to offer products of exceptional quality. The KÖMMERLING brand has in the past and continues to lead the European market for PVCU window and door profiles. As an industry leader KÖMMERLING goes further and embraces the responsibilities of an industry that is faced with the challenges of preserving a balanced and harmonious environment. The greenline® concept has been developed out of concern for the environment and perfected with the purpose to preserve natural resources by working to accomplish three mutually beneficial objectives : • To ensure ongoing improvements of the window system’s performance, through increased thermal insulation with a reduction of energy consumption and improved sound insulation. • To recycle the basic raw materials (PVCU, glass and steel) and to reuse them in the production cycle – with an improved efficiency through a lower consumption of raw materials and energy. • To optimise the use of raw material components and refine the product ensuring longevity with an increased lifespan of PVCU profiles. Since 2001, all KÖMMERLING window, door and roller shutter profiles have been produced exclusi vely with calciumzinc instead of lead ingredients. Calciumzinc is a new type of stabiliser. It makes PVCU profiles more resistant to weather conditions and since 2003 is produced inhouse. With the creation of the greenline® brand, KÖMMERLING continues to pursue a philosophy of excellence in an effort to help ensure human health and preserve the environment. In European countries such as Denmark, Switzerland and Austria, the use of lead based sta bilisers is already prohibited. Similarly, in Australia leadstabilised windows and door profiles will be outlawed as of January 2008. In North America the legislation to keep PVCU window and door profiles lead free has been in place for many years. Considering the health and environmental hazards of lead, most homes in a few years, will have to be equipped with lead free windows and doors. 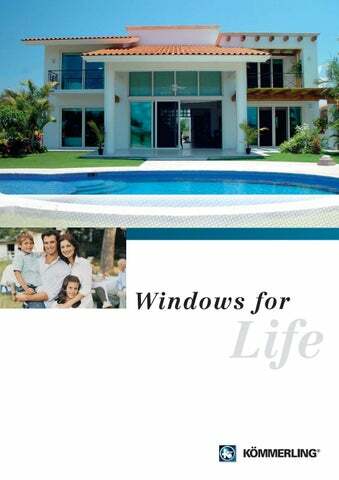 People’s homes will gain and maintain their value if equipped with greenline® windows! Choosing calciumzinc stabilised profiles for windows is a smart decision that will benefit everyone! profineis number one in Europe for uPVC window and door profiles and isthe market leader in many other countries as well.